Queen of the Hill is a chess variant designed by friends of Skud Pai Sho. Contact @SkudPaiSho on Twitter with any questions about the game. Queen of the Hill is a two player chess variant in which pieces are dealt to each player. The game is played in a series of quick “hands” with a typical game consisting of 4 hands per round and 3 rounds per game. The player who has accumulated the most points at the end of the game wins. 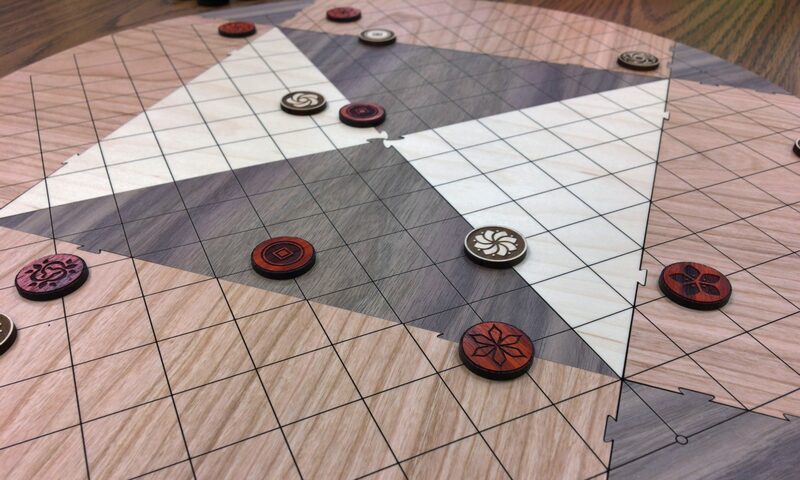 Players attempt to maneuver their pieces into a position from which they could take the white pawn in the center of the board. When a piece is in such a position it is said to have a claim on the pawn. A player wins a hand when they have more pieces with a claim on the pawn than their opponent has left on the board. When a player is dealt a card, he or she places the corresponding chess piece in the white squares as indicated in Image B, with the first piece given going in square 1, second in square 2, and so on. If a player chooses, they may move the piece one square to the right. They must decide where to place the piece before their next piece is revealed. When a player has enough pieces with a claim on the white pawn they declare “check”. The opposing player is given one more turn if they have a move to negate the “check”. The winning player gets one point for each claim they have on the white pawn at the end of the hand. After each hand, the white pawn rotates clockwise through the four middle squares (see Image C). This will result in Player One moving first in hands 1 and 4 and Player Two moving first in hands 2 and 3. Player Two should deal the cards for the first hand of a round. The deal should then rotate between the players with each hand. Before a game starts, players must agree to a number of rounds. Games should only consists of full rounds (i.e. 3 or 5 rounds not 2.5 or 4.25 rounds). After the predetermined number of rounds is complete, the player with the most points wins.